Theoretical physics is full of mind-boggling ideas, but two of the weirdest are quantum entanglement and wormholes. The first, predicted by the theory of quantum mechanics, describes a surprising type of correlation between objects (typically atoms or subatomic particles) having no apparent physical link. Wormholes, predicted by the general theory of relativity, are shortcuts that connect distant regions of space and time. Work done in recent years by several theorists, including myself, has suggested a connection between these two seemingly dissimilar concepts. 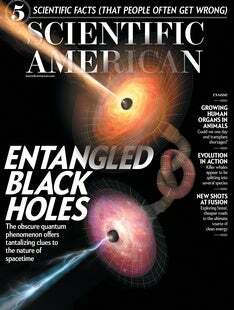 Based on calculations involving black holes, we realized that quantum mechanics' entanglement and general relativity's wormholes may actually be equivalent—the same phenomena described differently—and we believe the likeness applies to situations beyond black holes.